Estimating Corporate Wellness ROI: How Will YOUR Company Benefit? A frequently-cited 2010 report by Harvard University health economists found that the average savings in medical costs from using corporate wellness programs was $3.27. This conclusion was derived from a meta-analysis of 20-peer reviewed corporate wellness ROI studies. The Society for Human Resources Management finds that wellness programs return ROIs between 3.27:1 to 6:1. However, critics (rightly) point out that these studies do not draw on the gold-standard, randomized controlled trials, instead relying on quasi-experimental designs which are a less rigorous measure. Even so, senior vice president and chief health officer David Anderson of the Society for Human Resources Management comments that the “imperfect evidence” found by these studies is still more than is used most of the time by executive managers making important company decisions. That is to say, the evidence showing that wellness programs DO deliver a positive ROI for companies is better than the evidence that is used to ensure higher sales overall. So how do you find corporate wellness ROI? 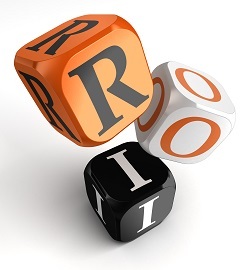 ROI stands for “return on investment,” and is exactly what it sounds like. The formula to calculate: Divide the amount saved as result of the program by the cost of rolling out the program. So an ROI of 6:1 means that for every ONE dollar spent, SIX dollars are saved! Beyond hard cost savings, other criteria can be just as important in evaluating the success of a company program. For example, can the company get a sizeable portion of employees to participate? Are the employees enjoying the program? How are overall health insurance costs being affected? Is there evidence to show improvement in employee satisfaction at work? Has there been a reduction in sick days? What about the number of employees who would recommend the program to another friend?